Although many people don’t think of their favorite charity or help group as a business, nonprofits are, in fact, considered to be businesses in the eyes of the law (albeit often tax-exempt ones). 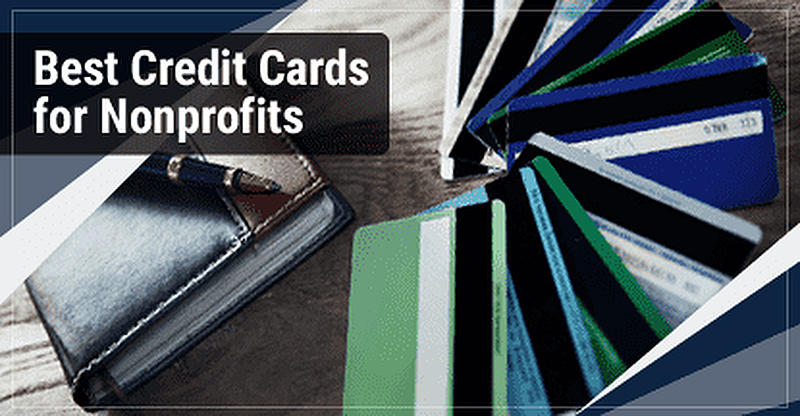 With that in mind, the best credit cards for most nonprofits are likely to be business credit cards. For one thing, they can help your nonprofit establish and build business credit. Another, perhaps more compelling reason is that many business credit cards provide purchase rewards and secondary card benefits that are designed with companies and organizations in mind, things like office supply rewards and free employee cards. Every extra hour spent trying to wrangle the most value out of your credit card rewards is an hour not spent helping your organization’s cause. Cash back rewards are generally the simplest type of rewards to earn and redeem, offering a set redemption value and easy redemption process without the need to calculate values or transfer points and miles. Plus, you can still make the most of your rewards by choosing cash back cards with bonus categories that fit your nonprofit’s needs. The Ink Business Cash℠ Credit Card is a good option for nonprofits with smaller budgets, as it offers high bonus-category earnings rates but has a low spending cap of $25,000 per bonus tier. The Capital One® Spark® Cash for Business is a good choice for those who don’t want to bother with categories or nonprofits that don’t have a lot of spend in common categories. You’ll earn unlimited 2% cash back on every purchase, with no spending caps. The Ink Business Unlimited℠ Credit Card offers unlimited 1.5% cash back on every purchase, everywhere, with no categories to track or activate. In addition to a great signup bonus and a very competitive intro-APR offer, this card charges no annual fee and offers free employee cards. The Capital One® Spark® Cash Select for Business is the less-expensive sibling of the Spark® Cash family, offering a lower earnings rate but charging no annual fee. Applicants with good credit may also qualify for a lower regular APR than the more expensive card offers. The SimplyCash® Plus Business Credit Card from American Express is a good choice for keeping your nonprofit’s office up to snuff, offering 5% cash back rewards for office supply and wireless service purchases, no annual fee, and a flexible credit limit. The SimplyCash® Plus card also provides 3% cash back in a bonus category or your choice, which means you can customize your rewards to match your nonprofit’s needs. Choices include US gas stations, restaurants, select advertising, shipping, or certain computer-related purchases. Although time can often be at a premium for busy nonprofits, it can be worthwhile to spend a little of it learning to maximize credit card points if a good portion of your organization’s budget goes to travel expenses. Not only do most credit card points provide the best value when redeemed for travel-related expenses like flights and hotel stays, but most points rewards credit cards offer bonus rewards for travel-related purchases. The Ultimate Rewards® cardholders earn with the Ink Business Preferred℠ Credit Card are some of the most popular travel rewards in the game thanks to the wide range of hotel and airline travel partners to which the points can be transferred. Even though most points and miles enthusiasts prefer to use bonus categories to maximize rewards, not every traveler wants to keep track of categories. The Capital One® Spark® Miles for Business offers rewards on every purchase that can be redeemed for a statement credit to cover any travel-related expenses. If the Capital One® Spark® Miles card appeals to you but the idea of an annual fee is less appealing, then the Capital One® Spark® Miles Select for Business is a good option. You can earn and redeem the same flexible miles without paying an extra fee. The American Express Business Platinum Card® is a good card for nonprofits that frequently make large purchases, as it provides bonus points for purchases over $5,000. The card can also be a good option for nonprofits that require frequent travel, as it gives significant bonus rewards for hotel and flights, as well as an annual airline credit and global lounge access. By nature, nonprofit organizations are not in it for the money. Their focus is on turning funds into action for whichever cause to which they are dedicated. So it makes perfect sense that many nonprofits are focused on reducing financial waste. While some credit cards can be worth the annual fee, there are enough great annual-fee-free cards on the market that your nonprofit can likely find a good fit without the fee. The Ink Business Cash℠ Credit Card‘s bonus categories are ideal for many organizations, offering significant cash back for office supply purchases, as well as communications services. Even better, the card comes with an intro-APR offer on new purchases to help you avoid fees when income is sporadic. Not only does the Capital One® Spark® Cash Select for Business come without an annual fee, but it doesn’t skimp on the perks because of it; you can still earn unlimited cash back, earn a solid signup bonus, and enjoy an intro-APR offer good on new purchases. Like its cash back sibling, the Capital One® Spark® Miles Select for Business combines unlimited rewards with an introductory interest rate offer for new purchases and a fairly easy-to-reach signup bonus. The Blue Business Plus Credit Card from American Express is a good option for nonprofits with expenses that don’t fit regular bonus categories, offering 2X points per dollar on purchases regardless of category. The Business Advantage Cash Rewards Mastercard® from Bank of America offers similar bonus categories to other business cards, offering 3% cash back on gas station and office supply purchases on up to $250,000 in combined category purchases each year. The card’s signup bonus, which is likely easily attainable for nonprofits with even modest budgets, paired with the lack of an annual fee likely makes this a good card for smaller nonprofits. For a fledgling nonprofit, establishing business credit can be a long and involved process, particularly if its owner’s credit isn’t stellar, either. But your nonprofit isn’t out of luck if your credit score leaves a little to be desired. There are a handful of business credit card options that will accept applicants with fair credit, though most options will be for secured credit cards that require a deposit. Outside of the community banks and credit unions, the Capital One® Spark® Classic for Business is the only business credit card designed for those with fair credit. Even so, the card still offers unlimited cash back rewards and charges no annual fee. The Wells Fargo Business Secured Credit Card requires a deposit to secure your credit line, but it can be a good way to establish and start building that all-important business credit. You’ll even earn rewards as you do so, with 1.5% cash back on every purchase. The BBVA Secured Visa® Business Credit Card is also secured, so it will require a deposit to open. Cardholders earn 3X points in a category they select from the given options and 2X in a second selected category. The minimum required deposit to open a BBVA Secured Visa® Business card is $500, and the size of your credit line will be equal to 90% of the size of your deposit. Nonprofits play an important role in our society, often helping those who cannot help themselves. But for all that, they do not have the same goals as your average business, nonprofits are still, technically, businesses. As such, nonprofits have many of the same financing needs of any business, including things like office supplies and travel. With the right business credit card, your nonprofit can save on these big expenses, making more room in the bottom line for the important things.